Barranco the southernmost garifuna village in Belize. The birthplace of prominent educators and the late great Andy Vivian Palacio. This month I am doing a write up about the Village of Barranco, the birthplace of Andy Vivian Palacio. The History of Barranco is taken from the 1997 Warigoun Barangu booklet. Barranco is a beautiful Garifuna Village located in the southern coast of Belize. It is believed that the village was settled circa 1860 by Santiago Avilez. Barranco was once a thriving village with fishermen and farmers. The settlers and their decendants grew their staple foods including cassava, rice, cocoa and plantains. The soil in Barranco is very rich and produced the best tasting fruits in the country and was know for the sugarloaf pineapple. Barranco also is the home of unique fruits like molly apple, star apple and masapa. The inhabitants also raised their own poultry and livestock. Due to migration to seek employment, the population of the village is now a little over one hundred. However, the relatives return to their beloved village on most holidays or to attend a mass, dugu or funeral. 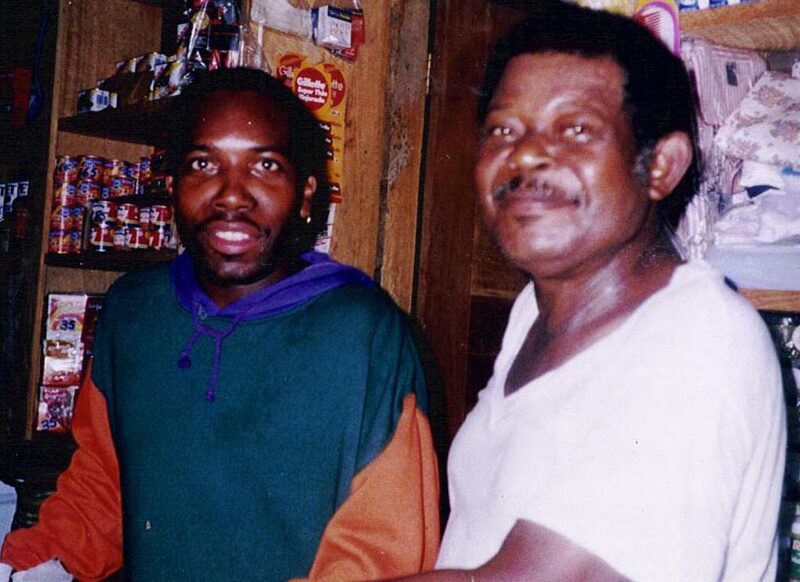 Barranco is recognized as one of the last traditional Garifuna communities in Belize. Barranco from it's humble beginnings has had three Roman Catholic churches. 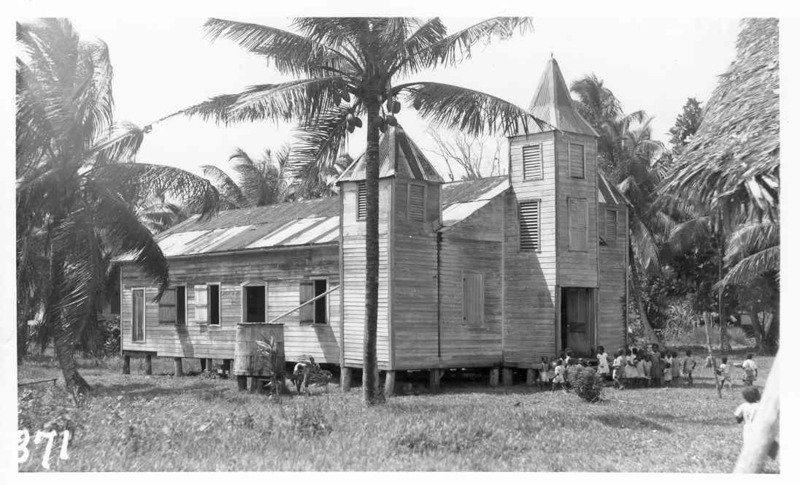 In the photo album you will see picture of the original church and the current church. I cannot locate picture of the second church. Barranco is also known for the great teachers and contributors to Belize who were born and raised there. Some of the great teachers are Mr. Sam Daniels, Mr. Candido Arzu, Mr. Victor Nicholas, Mr. Theodore Palacio, Mr Fab Cayetano, Mr Sab Cayetano, Mr Roy Cayetano, Mr EP Cayetano and the list goes on and on. Mr Theodore Palacio as lead the Garifuna Choir for a number of years. He grew the choir to acclaim in Belize. Barranco boasts a small quaint postoffice, a large Dabuyaba, a large Church, a community hall, a school, a Police Station and a Museum. Barranco is the birthplace of the late Victor Nicholas, the late Andy Palacio, Ted and Bridget Palacio, Dr Joseph Palacio, Linda Arana, Fr. Calistus Cayetano, Sebastian Cayetano, Silas Cayetano and a host of other garinagu. Link to the History of Barranco. There will be a basket class held in Barranco from August 3rd through the 7th. It is for the upper division primary students. This class is to introduce basket weaving techniques to the students. This is the third year this class is being offered. This year we are also offering two new classes. There will be two cooking classes offered during the week of August 10th through the 14th. One for lower division students and another for upper division students. Basic nutrition, cooking with leftovers, using traditional foods in different ways, bread and pasta making, traditional Garifuna cooking and desserts will be covered. All the classes are sponsored by Tuani Garifuna Tuba Liburu(The Garifuna Library of Barranco) along with the Barranco Branch of the National Garifuna Council, The National Garifuna Council and SATIIM. Appreciate the update Kevin. As I recall US Capital had been stopped from performing exploration due to non compliance with Environmental Regulation. I would assume from this update that they are now in compliance. Would be good if Evan Caye would review an electronic copy of the EIA and its stipulation, as this should be a public document. I would imagine that this EIA is posted on the website of the Dept of Environment, but would be good if someone can confirm. The villagers should also have access to a hard copy of the document. As a sign of goodwill it is with great enthusiasm that I make it known to all Barangunas as well as friends of Barranco and even those who are simply Baranguna at heart. A point of interest, the Oil Company, U.S. capital is beginning to operate in the Sarstoon-Temash National prk. and have set up their headquarters in the village as well. I do hope that if anyone who intend to work with them, they should contact The Barranco Village Council. If by chance you know any of our people out there please pass on the information. The building is Olivia Avila’s house in Barranco, built in her family lot. Mrs. Olivia Avila is the daughter of the late Mr. Joseph Pollard Palacio and Mrs. Hilaria (Lala) Palacio. Mrs. Avila saw the time coming when she would need to settle down in Punta Gorda, her adapted home (where her husband, Cyrillo Avila is from) because she was getting on in age. Rita Enriquez, her daughter who partly grew up in the original house and had fond memories of life in Barranco decided to add to the house to make it a holiday home. Then the idea came; perhaps the house can be made into a Garifuna Culture House to display and preserve Barranco Garifuna artifacts, and host language and cultural retrieval workshops for the children and youth of the village. Rita Enriquez had observed that the Garifuna language and rich culture was slowly slipping away from the younger generation. This idea was discussed with family members and they all gave encouragement and support. The Lan Barangu Luban Garifunaduau was inaugurated with Baranguna in full attendance on November 15, 2005. The value of the building including the artifacts is approximately $100,000. The artifacts were bought from the villagers at reasonable rates. There is hope for expansion and improvement as foreign and local tourists keep coming to visit. There is the saying that you have not come to Barranco if you have not visited Lan Barangu Luban Garifunaduau. There is also the need for the establishment to be a resource centre for our youth. Presently, Mr. Paul Palacio is curator/caretaker. He is a diligent worker. Olivia Avila, my mother and I try to be there at least once a month. Rita Enriquez has been an educator for most of her life. She acquired her educational foundation in the schools of San Antonio, Toledo (with her uncle, Mr. Theodore Palacio as principal), Barranco, and Punta Gorda. At the tender age of sixteen she began teaching, first at St. Joseph School in Barranco and then at St. Peter Claver School in Punta Gorda. In 1972 she became a trained teacher and later got married to Lloyd Enriquez, then moved to teach at the Belmopan Junior School. In 1992, she became the principal of the Belmopan Upper School, later named Garden City Primary School from which she retired from the primary school system in 2005. Rita and Lloyd have three sons, Lloyd Jr. Glen and Colin. She holds a Master’s Degree in Educational Leadership and is presently a lecturer at the University of Belize, Belmopan Campus. Rita Enriquez whose right name is Alberita Avila Enriquez is now pursuing a doctoral degree in education from Nova Southeastern University. Last Thursday Sam Martinez turned 100 years old. Martinez is originally from Barranco Village in the Toledo District but now resides in Edinburgh. A release from the Belize High Commission in London says Martinez joined a number of men from British Honduras in answer to a request from colonial government for men to work in the forests of Scotland and contribute during World War II. The group also included Amos Ford, Mr. Phillips and Carlton Fairweather. They arrived in Scotland in November 1942 and were deployed t forestry camps all over Scotland to fell trees for the war efforts. Martinez is featured in a documentary called “The tree fellers” and his story as well as that of other noteworthy Belizeans such as Nadia Cattouse are featured at the Imperial War Museum in London and can be accessed on www dot IWM dot Org dot UK. I am pleased to announce the schedule of classes that will be offered this summer to Barranco children. This year there will be four classes offered. All classes will run from Monday to Friday beginning at either 9:00AM or 2:00PM and ending at either 11:00AM or 4:00PM. There will be no charge for classes. All materials and tools will be supplied by the teachers. Please fill out and return form on or by the 12th of April to be considered for enrollment. Student enrollment is limited. If the number of students is higher than the maximum enrollment for a class, the students will be chosen by lots. Class members will be told if they are in a class by April 18th. This class is for girls only to expose the students to basic carpentry skills. Students will learn to use hand tools and pwer tools to build a bench that will be donated to the school to be used on the school veranda. This class will be taught by Miss Dawn and has a limit of 8 students. This class will be offered from the 16th of August through the 20th of August. The class will be in the forenoon from 9:00AM to 11:00AM. This class is open to girls from the age of 7 through 16. This class is for young boys and girls and will introduce them to basic skills in cooking. Broiling, baking, poaching, simmering, folding, frying and other cooking skills will be consider while creating great food. Emphasis will be placed on foods and skills that should be new to the students. This class has a limit of 4 students This class will be offered from the 9th of August through the 13th of August. The class will be in the forenoon from 9:00AM to 11:00AM. This classes is open to students who have completed Infant 1 and have not completed Standard 2. This class is for young men and young woman . This class will emphasis foods from various different cultures and the different skills required to prepare them. What this class does will be driven by the interests of the students. Try new things expand ones awareness. This class has a limit of 4 studentsThis class will be offered from the 16th of August through the 20th of August. The class will be in the evening from 2:00PM to 4:00PM. This class is open to students who are in high school or other secondary school. This class is for boys and girls. This will introduce children to basic basketry skills. Student will complete several baskets during the week. Weaving and twining will be some of the skills learned. This class has a limit of 8 students. This class will be offered from the 16th of August through the 20th of August. The class will be in forenoon from 9:00AM to 11:00AM. This class is open to students who are in standard 4 or higher. This form must be completed and returned to Carlson by the 12th of April. No application will be accepted after that date. On behalf of the United Garifuna Inc. New York State Chapter and our President Mr. Alfonso Cayetano his nephew, we hereby extend our sympathy to the family of Mr. Silas Cayetano a former Educator, Public Servant and Senator of Belize. He died suddenly yesterday Saturday the 18 th of September, 2010 in Belize City. He will be sadly missed by all of us and his contributions to our citizens and country will never be forgotten. State Funeral arrangements will be made public as soon as it becomes available to us. May his soul rest in peace. The wake for Mr Silas Cayetano will be on Wednesday September 22 at 7 pm at Birds Isle in Belize City from 7 - 10 pm. The funeral service will be on Thursday September 23 at 2:00 pm at St Ignatius Church in Belize City. This is Grand Me dancing. This was taken in 2005 Dec 3. This was at a birthday party for the late Clarence Marin who was the oldest male in Barranco at this time. Mrs Rita Enriquez gave the oldest man and the oldest woman a birthday party. That was a great gift to the community. I took this picture on September 3, 2011. Alice Noralez and I went to visit with Grandma Me. Grandma made sure she summoned me to go show her the Organo Gold Coffee that I sell. She wanted to hear about the health benefit. Grandma at age 99 was the oldest person in Barranco. She also still made coconut oil. It is the best coconut oil in Barranco. 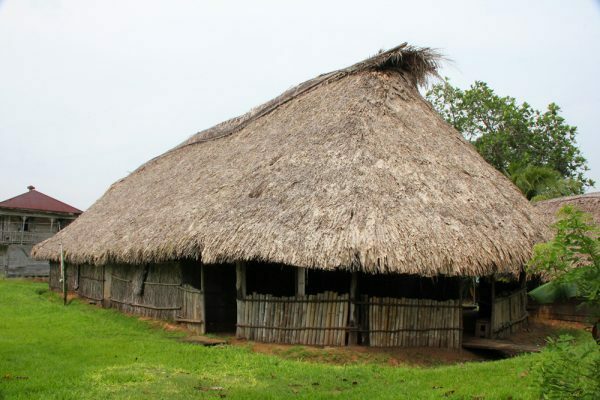 This is probably one of the most important vernacular Garifuna architecture found in Central America. This building, called the dabuyaba, is where traditional ceremonies are performed, among those, the Dügü. This one in particular is located in the Barranco Community in Southern Belize. The Garinagu (plural of Garifuna) translate the word Dügü into English as “family reunion.” The Dügü is indeed a week-long family reunion, but not of just one family; it is a reunion of all the families in the community. One family is the host, while the other families attend as a sign of unity. Even Garinagu from outside the community travel long distances to celebrate this very special event. They all get together to celebrate life after death, as the Garinagu believe that the spirits of their ancestors are also present in the sacred ceremony. The Garinagu believe that the flesh dies, but not the spirit. Also, they believe that unhappy ancestral spirits can cause bad karma, so they try to appease them with a feast during the ceremony. During the Dügü, all the participants concentrate in the dabuyaba and spend the week there; celebrating, eating, playing drums, praying, dancing, and even sleeping. Three drums play different traditional tunes. Each drum represents the past, present, and future. A buyei, or traditional healer, blesses people and things and communicates with the ancestors. The dabuyaba is considered as a temple. 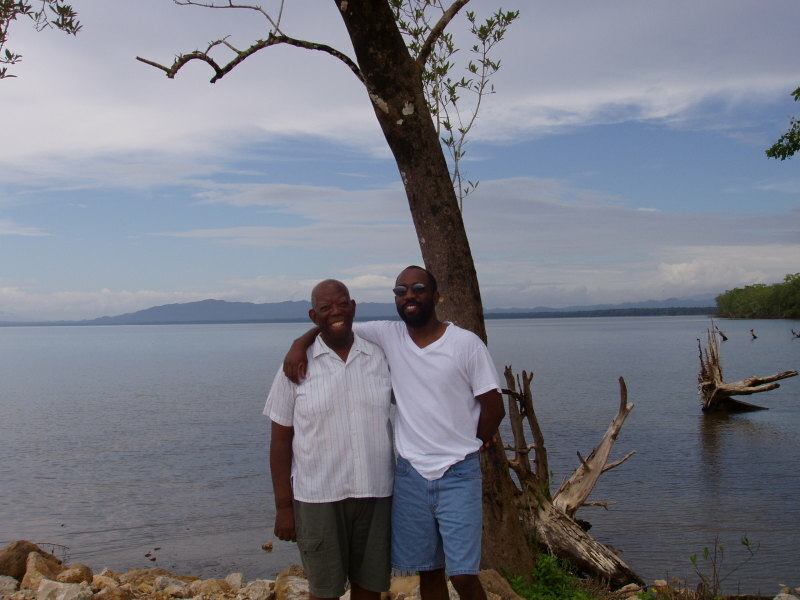 The dabuyaba is built facing east, towards the Caribbean Sea and welcoming the sunrise light as a sign of life. On this side there’s an open area that resembles a porch. On its sides, it has doors facing north and south. At the closed west end is the priest’s inner sanctum, dugeirugu, where the host family retires whenever anything important is about to happen. 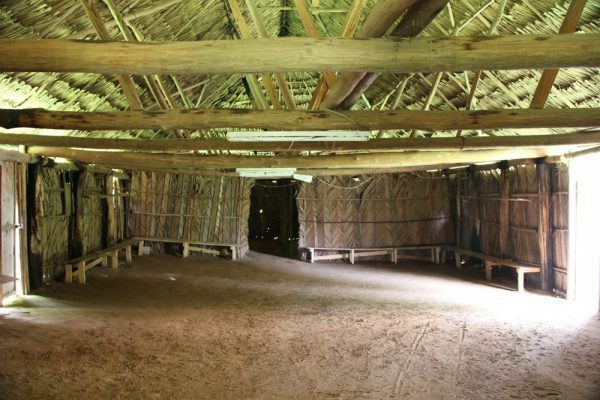 The main room in the center, tanigi dabuyaba, is the heart of the ancestral house – where everyone gathers as one. A new dabuyaba is built if the ancestors request it. If so, the process begins with the gathering of cohune palm leaves. The gathering of leaves and materials for the new temple constitutes a ritual of purification. While builders chop and gather leaves, the drums are played. The land where the dabuyaba is to be constructed is incensed, blessed with holy water, and sprinklered with rum. Then, the wood posts and lintels are put in place to create the structure, followed by the palm leaves for the roof and walls. This type of building is always located closed to the beach and has a longitudinal shape often used in “traditional” temples. There is no better evidence than this building to say that spirituality and cultural identity is what keeps the Garifuna community together. Statement re the EIA Consultation for October 25, 2012. On behalf of our village Barranco, we take this opportunity to present this short statement to the EIA consultation held at Sunday Wood October 25, 2012. Our village brings to this consultation some unique characteristics that highlight Barranco as one of the frontline communities in the current exploration for fossil energy in the Toledo District. It is the oldest of the adjoining villages, having been founded more than 150 years ago. It is a Garifuna community. The Garifuna people share an indigenous origin to the larger Central American-Caribbean subregion. More especially, in the case of Barranco, the British found the Garifuna people here when they first placed their survey lines in this area in 1892. It is the last coastal village in southern Belize. It is one of the buffer communities to the Sarstoon/Temash National Park that looks forward to the legitimate and sustainable exploitation of the Park’s resources. Finally, like the other frontline communities, it is economically depressed and desperately seeks all opportunities for the sustainable exploitation of our natural resources for the benefit of our current population and generations to come. Locating the helipad at an inconvenient spot in the village, where pedestrians walk, including school children coming and going to school. What most displeases us is that we addressed these impacts by letter and through meetings with company representatives. Unfortunately, the response was not in proportion to the seriousness of the problems. Rather, until they broke camp and left the village, the company continued its high-handed contempt of our people, leaving behind such disservice, as the deteriorated conditions of our streets and wharf. These actions together with the attitude of the oil company form the background to our response to the current EIA consultation. We find ourselves unable to respond to the details of this EIA report. First of all, we became aware of it a little less than two weeks ago. Secondly, it is a highly technical document that would have to be explained to us so we could understand it fully to be able to respond. Unfortunately, we are sensing the same kind of interaction that we in Barranco had with the previous phases of oil exploration, namely, a feeling that the oil company can do whatever they want within our community and that they do not have to account to the community nor have the courtesy to respond when reasonable complaints are made to them. In conclusion, we are unable to respond to this EIA report not from any fault of ourselves. We are asking that the responsible arms of our government take the initiative to explain to us the details of this EIA report. We feel that as public officers – paid from our hard-earned taxes – they should come to our community and guide us through the technical procedures mentioned in this report. Finally, we request that the company conduct an objective assessment of the overall social and economic impact of their previous stints in our village as a way of understanding what could take place when large scale drilling starts within the vicinity of our villages in the Toledo District. We will be looking forward to a response from our public officers and the oil company to these serious concerns of ours. Thanks very much, which translates in our language, as Seremei. your artical is very good ,thanks for ur sharing and i have learn many things from it .